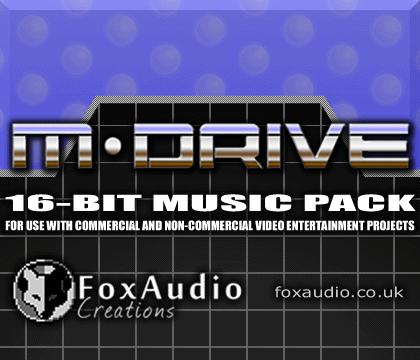 M-DRIVE 16-bit Music Pack| RPG Maker | Create Your Own Game! M-DRIVE is a varied collection of music and sound effects that are inspired by a certain classic 16-bit games console of the early nineties. You know, the one with a controller that looked like a fat boomerang and a TOTALLY RADICAL spiky blue mascot. Yep, that one. Each of M-DRIVE's music tracks and sound effects has been lovingly crafted by composer Snowy Fox using the same synthesis method as the original console's Yamaha sound chip, in the styles of many of the games we grew up loving, holding the idea of an action RPG in mind, but the pack is also open to several different game genres. Click here for a link to the M-Drive demo game! 16 sound effects for menu screens and a few common actions, such as attacking, taking damage, and moving from map to map. Some are abstract, some diegetic – if retro-sounding! Please note that this music pack is licensed for use in RPG Maker only!